Just as chic and sophisticated as his creations, the signature scent from designer, Vince Camuto and Parlux Fragrances, is a perfume of timeless elegance and style for today’s woman. This is a luxurious, polished floral chypre scent crafted by perfumer, Steve DeMarcado that is a compelling and complex blend of femininity. 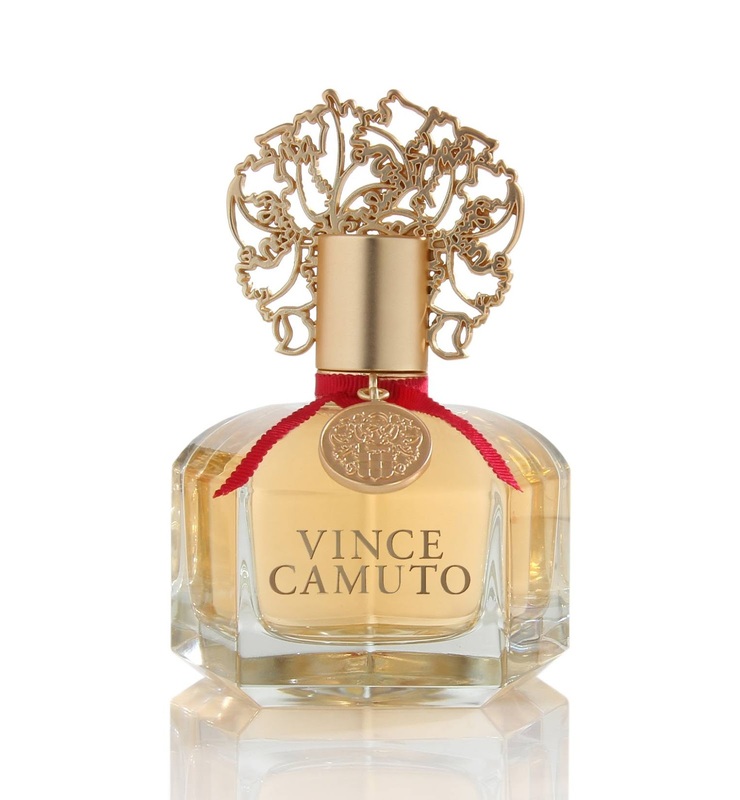 The top notes of Vince Camuto start out spicy and sweet with intoxicating notes of rum absolute and osmanthus nectar. As the fragrance further develops, the Bulgarian rose and night-blooming jasmine add romance and opulent richness. Yet, there is a touch of the exotic to the glamour. Notes of leather weave through this perfume as well like a lover’s protective embrace to give it strength and comforting warmth. Once the vanilla absolute, patchouli, amber and skin musk become apparent, the scent mellows into one of soft seduction and romance. The beautiful glass bottle adored with red ribbon itself is a treasure. From the stylish cap sporting the logo to the gold of the chain, you feel privileged just touching it. At the same time, you will feel incredible once using Vince Camuto–as if you’re wearing the latest style to be envied! This is how elegantly attired the scent makes me feel and know you would love to have that feeling too. Do look for this new perfume! Thanks to Vince Camuto, three lucky Nuts 4 Stuff readers in the United States win a 3.4 fl. oz. bottle of Vince Camuto Eau de Parfum Spray ($78)! 1. You must follow me on Google Friends Connect before any of your entries will count. If you already follow, then tell me the name you follow me by in a comment along with your email! 2. Go to Vince Camuto and tell me what makes this perfume so appealing or something you learned from the site in another comment. Leave a separate comment for each entry. Be sure you include your email address inside your comment so I can contact you if you win. This giveaway is only open to residents of the United States. No PO boxes just USA-based street addresses. Do follow the rules because I check entries. Be alert that if you attempt to enter using multiple identities will be grounds for disqualification. This giveaway ends March 9, 2012 at 12 PM Eastern Standard Time. The winner will need to respond to my email with name and shipping address within 48-hours or another winner will be picked. Previous Post My Golden Yeast Bread Recipe Will Make You Hungry for Homemade! gfc eclairre(at)ymail(dot)comI learned there is Jewelry on the website. I learned this fabulous fragance has Bulgarian Rose, which is an exquisite ingredient people call 'liquid gold'. I would be honored to try such a fragance! Plus Vince Camuto offers everything to indulge a woman from head to toe. Beautiful products! Follow Vince Camuto on Twitter. I subscribed to Nuts 4 Stuff in reader. Thank you! the bottle that it comes in makes it very appealing itself. I follow you on GFC as rusthawk. I learned from the site that i can also but a gift set of this perfume which includes fragrance, body lotion, bath and shower creme, and roll-on fragrance. Follow on GFC by the name of red66060. I love that the heart of this fragrance is composed of Bulgarian rose and night blossoming jasmine with leather notes! I also entered your I Fancy You (3.4 oz.) Perfume by Jessica Simpson Giveaway! I entered another giveaway: Rebelle perfume by Rihanna giveaway. I love the bottle alone, but the notes that blend into a chypre scent are exactly what I love! I like all the scents! I like that it mixes floral notes with amber and leather ones. I learned that all orders ship from New Jersey. I tweeted the requested message on Twitter at https://twitter.com/#!/likwan/status/178097157268705280. I follow you via Gfc and I think what makes Vince Camuto so appealing is by how his products are advertised, the way it makes them seem more classy then other stores. the base of this fragrance consists of vanilla, absolute, sensual patchouli, hot Brazilian amber and leathery musk.